by Ken Marcella, D.V.M., Article donated by the mane points horse resource center. The term moonblindness remains from a time when diseases were as much about myth as they were about medicine. 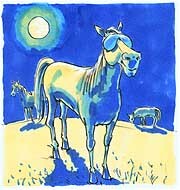 Horses with this condition experienced eye pain in the sunlight and prefer to be outside at night. It was said that they had been blinded by the moon. Affected eyes would eventually become a cloudy, pale blue, and would resemble the color of the full moon. The condition itself would come and go, and some believed that it followed the monthly phases of the moon. Like most early disease names, this term, too, proved to be fairly off the mark. Modern veterinary medicine calls the disease equine recurrent uveitis or periodic ophthalmia. The uvea is the inner lining of the eye, and this very vascular (well-supplied by blood vessels) tissue can become inflamed or infected. Ophthalmia is another way of referring to an inflammation of the inner eye that tends to flare up, regress or disappear, then flare up once again. Many agents have been implicated in equine recurrent uveitis, but the highest percentage of moonblindness is blamed on leptospirosis, a bacteria commonly carried in the urine of cattle and deer. The most likely method of transmission is contaminated drinking water. Horses grazing pasture with access to streams or ponds where cattle or deer water often show titers (antibiotic levels in the blood) to leptospirosis and some outbreaks have been directly linked to these water sources. Other bacterial causes are possible, however, because many affected horses do not have high leptospirosis titers. Among these are brucella (more common in cattle), streptococcus, viruses such as equine influenza and equine viral arteritis and some parasite larvae, notably onchocerca, strongylus and toxoplasma. Diagnosis is made on the basis of clinical appearance and lab diagnostics. These horses initially show painful, tearing eyes with clear-to-slightly cloudy ocular drainage. The eyes are held closed in bright light and the conjunctiva (the white tissue around the globe of the eye) is red and irritated. Horses may be off feed and may behave abnormally, depending on the degree of pain and their individual tolerance levels. Why certain bacteria and viruses take up residence in the eyes is not known, but that the eye is isolated from the rest of the body's systems explains the flare-ups and regression of the disease. The fluid in the eye is not readily shared with the rest of the body; therefore substances in the eyes are separate from the body and each eye is separated from the other. Many horses can have advanced recurrent uveitis in one eye while the other is unaffected. Proteins are produced in the fluid of the eye as the immune system responds to ocular irritation. This fibrin tends to make the eye cloudy and imparts a blue color to the globe. The immune system will slow down or reduce the bacteria, virus or parasite and, after a few days, the flare-up will resolve. The horse can then appear normal for a time until some stress causes the foreign agent to become active again. Immune-mediated diseases are caused by the body's overzealous response to a problem. In these conditions, a parasite, bacteria or allergen enters the body and is recognized as foreign by the body's defenses--the immune system. The system responds with specific cells and internal reactions designed to destroy the invaders. In most cases, the immune system kills the invader and removes it, and all is well. In immune-mediated diseases, however, the body cannot kill and remove the problem, and the defense response is so exaggerated that the very cells and toxins used to protect begin to damage. Massive inflammatory responses occur and the body is literally destroyed by the attempt to heal itself. Moonblindness is a classic example, but immune-mediated diseases can occur in the skin, lungs, intestines and kidneys. Eventually, these recurring periods of flare-up and damage will lead to blindness in the affected eye. The invading organism can get into the bloodstream and into the opposite eye, as well. For this reason, badly affected eyes with severely reduced vision and recurrent painful episodes are removed to eliminate the source of the infection and to preserve the remaining good eye. The main goals of treatment are to preserve vision, reduce and control inflammation and discomfort and minimize permanent damage. Owners must become aware of the early signs of an impending flare-up because the earlier treatment is started, the quicker the inflammation will resolve and the less immune-mediated damage will occur. Treatment consists of topical and systemic corticosteroid application. Steroid and antibiotic ointment is placed in the eye several times per day. It is important that owners learn to differentiate between moonblindness flare-ups and other causes of eye inflammation. Staining the eye to look for corneal damage is an important first step; horses with corneal damage should never receive steroid ointment. The absence of stain uptake on the globe of the eye confirms an inflammatory condition and uveitis treatment is then begun. Severely affected horses may need injections of corticosteroids in the tissues around the eye. Phenylbutazone, aspirin and banamine are also used to help with inflammation and pain. Antibiotics are only occasionally used because affected horses are rarely systemically ill and, though bacteria may cause the disease, it is the immune response--not the infection--that causes the damage. A surgical procedure called vitrectomy is showing some promise. Surgeons remove tissue lining parts of the eye and replace fluid in the eye during this operation. There is some disagreement as to why this works and what benefit it provides to the horse, but test cases have shown enough promise to make this a continuing area of research. The implantation of small beads of a drug called cyclosporin has also shown some promise. In this procedure, small beads containing a slow-release form of this anti-cancer drug are imbedded in tissues of the eye. This drug inhibits the recurrent flare-ups and seems to drastically slow the progression of the disease. A vaccine for leptospirosis, recommended for horses at risk, is also somewhat controversial--some horses have negative reactions to this attempt at protection. Recognizing cases early on and treating them aggressively will help. Maintaining clean water sources and closed pastures to limit contact with cattle and deer also makes sense. Ken Marcella, D.V.M., is based at the Chattahoochee Equine Center in Canton, Ga.
Read the next horse diseases article on Myopathies, Azoturia or Tying Up.